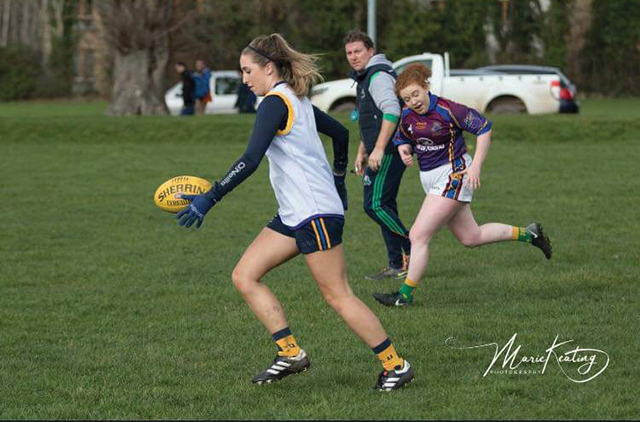 After a training session in Perth last November and following Collingwood’s Sarah Rowe and The Giant’s Cora Staunton, Denise Burtenshaw has been inspired to make the Irish University AFL panel. “I was over in Australia in November and I went to an AFL training session over there, so I kind of got a taste for it then and started following the Irish crowd that have gone over like Sarah Rowe and Cora Staunton,” said Burtenshaw. “I started watching some of their games and said ‘this is a great sport and it would be great to get involved in’,” she added. Club commitments with her Meath Intermediate club St Colmcille’s ruled Burtenshaw out from playing with the O’Connor Cup team in DCU, but tag rugby with DCU and her Gaelic football background made her switch to AFL very natural. Following the establishment of the Women’s AFL club in DCU by Michael Kitchens, Burtenshaw and friends decided to try a beginners training session in Islandbridge. “We went down and realised most of the people there actually play AFL so we were completely out of our depth,” she said. Burtenshaw played with girls from a mix of Universities in a mini-blitz with her side beating the other beginners on the day. “We played against UCC, AIT, UCD and UL and we ended up winning the cup that day,” she said. “We kind of made a show of ourselves at the cup with obviously not knowing the rules but with the Gaelic background we kind of had an idea of how to play,” she added. Following their success in the Islandbridge blitz, Burtenshaw, fellow clubmate Hannah Tobin Jones and Shauna Hendrick (all DCU students), were all called up to the Irish University panel. “Mike Currane, who is in charge of the university team, gave us a call up and asked us if we would be interested in playing for the Irish university panel,” said Burtenshaw. Understanding the different nature of the full contact sport in comparison to ladies Gaelic football, Burtenshaw believes it was from her Gaelic skillset that she made the transition to AFL rather than tag rugby. “Obviously, I didn’t want any injuries for Gaelic and having [tag rugby] helped with the transition [to AFL] but it was from the Gaelic I was scouted,” she said. “I wouldn’t say scouted it was more like whoever plays Gaelic do you want to come play AFL,” she joked. When asked if she would like the chance to join the Irish players going professional in Australia Burtenshaw told The College View, she would always take a great opportunity like that. “I think I’d take any opportunity like that. I don’t think it’s a call you’d get very likely so any opportunity I get to go abroad [I’d take],” she said. In terms of the Irish team Burtenshaw looked forward to hopefully being selected for the first Irish Women’s University match against England at the end of April. “We played a blitz called the Leprechaun Cup up in Belfast,” she said. “On the 13th of April we start training for a starting position to play England in the first ever university match,” she added. Looking to the future of the sport in Ireland, Burtenshaw explained how the sport hopes to expand. “There are a number of teams being set up to facilitate girls who aren’t in a university to play AFL with the hope of then trying for the Irish team outside the university panel,” she said. “There is a European Cup at the moment but UCC are a well-established team, so they have a huge panel and they have Marie Keating, an established AFL player training them. “It would be great to get a chance to play,” she added.